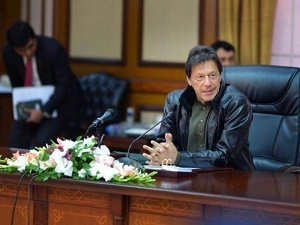 Prime Minister Imran Khan on Monday launched a health insurance programme for the poor and the underprivileged strata of the society. On the occasion, the premier empathised with lower income groups, stating that healthcare is often unaffordable for them. During the address, the prime minister said that “no nation prospers without investing in its people”. The PTI government is inviting investors to the country, thereby enabling Pakistan to achieve maximum potential and becoming a welfare state. Speaking to the participants, Minister for Health Aamir Mehmoud Kiani said under this scheme, each deserving family will be able to obtain medical care worth Rs720,000 annually, Radio Pakistan reported. He further commented on the historic move, lauding that this is the first time that such an enormous package has been announced for betterment of low socioeconomic groups. The health minister added that 15 million people will be provided the health cards in the next two years. He said this scheme is being launched in Punjab, Kashmir, Gilgit-Baltistan, FATA and the federal capital. 85,000 families will be provided health cards in Islamabad and every card holder shall be provided transport up to Rs1,000 per hospital visit.